SPIRIT OF UKRAINE LIVES UP TO ITS NAME! 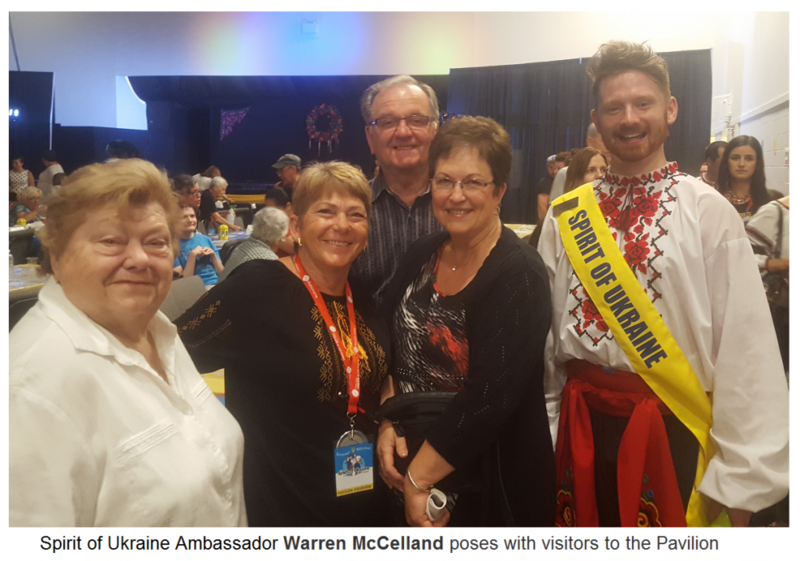 The 2nd week Ukrainian Pavilion at Folklorama 2016 – SPIRIT OF UKRAINE - offered an enjoyable, user-friendly and inspiring event for Winnipeg’s festival of nations, It may have been a bit of a hike for some to get to the pavilion “out by Ikea”, but once you got there, there was ample parking and the spacious interior offered good-moving line-ups and uncomplicated movement to the various aspects of the venue. The Ukrainian food, provided by Naleway Catering was enjoyed by all. 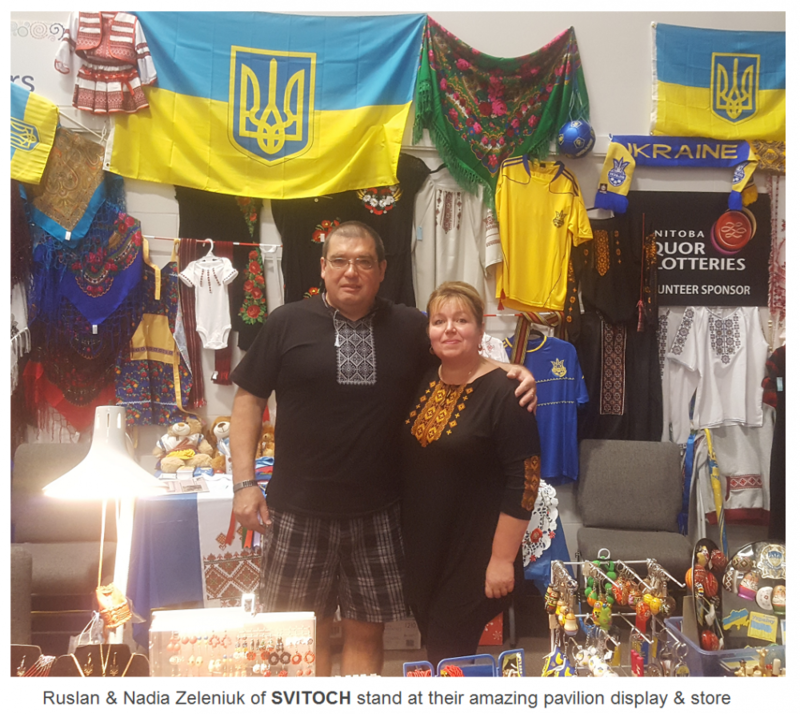 One of Winnipeg’s best Ukrainian souvenir supplier SVITOCH Ukrainian Import Export (621 Selkirk Ave, Winnipeg) operated by Ruslan & Nadia Zeleniuk wowed visitors with the excellent selection with truly ‘something for everyone’. Then there was the performance…. The Spirit of Ukraine brought to their stage this year the sensational folksong ensemble ROZHANYTSYA from Ukraine that exposed 21st Century Winnipeg to ancient ritual songs from remote areas in Ukraine. This was complimented by the always astonishing ZOLOTO Ukrainian Dance Ensemble and Company. A number of their various groups of dancers of all ages delivered outstanding performances every time. The long-lasting HOPAK finale left everyone breathless – the performers and the members of the audience alike. The amazing thing about this year’s show was that since Zoloto is celebrating 25 years, they invited all their dancers to return for Folklorama. They’ve all still got it! In fact, besides their totally professional execution, they exhibit a raw energy and heart-felt enthusiasm that is not always present in the contemporary tendency for abstract and experimental style. 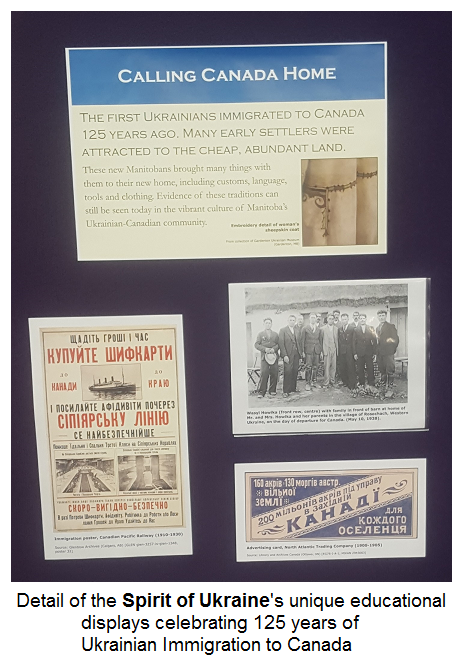 The exhibits for the displays were made possible by the Sandy Lake Ukrainian Culture and Heritage Museum, the Fort la Reine Museum, the Gardenton Ukrainian Culture and Heritage Museum and the Transcona Historical Museum. The Pavilion was once again located at the fantastic facilities of the Soul Sanctuary in the south end of the city at 2050 Chevelier Boulevard. The Coordinators were Keris Matskiw and Scott Gordon. The Ambassadors were Nicole Works and Warren McCelland. The Youth Ambassadors were Yelena Romaniuk and Iryna Medvid.